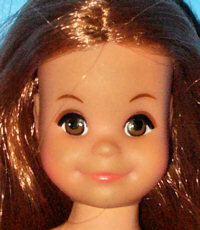 Pose 'n Play Tiff Doll was introduced in 1972 as Skipper's TomBoy Friend. She had the same head as Living Fluff and the same body as Pose 'n Play Skipper (which was the same as Living Skipper). Today, Tiff is very hard to find.